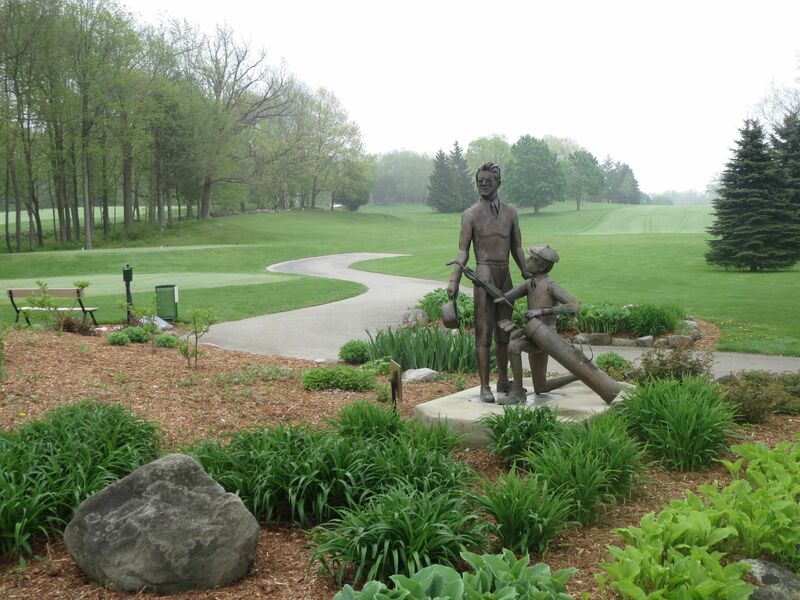 I’ve been wanting to play the course at West Bend Country Club for a lot of years, and finally got my opportunity this past weekend with a couple of buddies from North Hills. 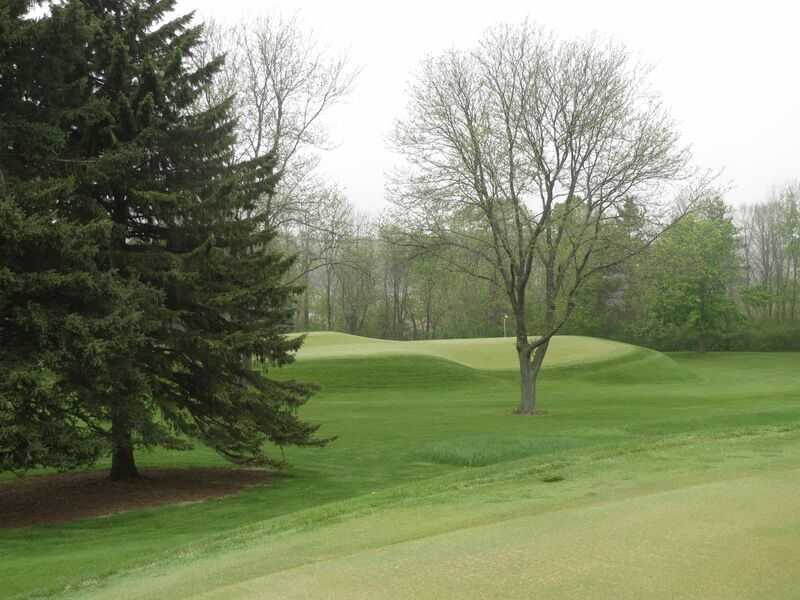 What always intrigued me about West Bend is its bloodlines – designed by William Langford in 1928, I had always heard that it is a slightly less links-style course with all of the great green complexes of Lawsonia, but with better elevation. Boy they were right. 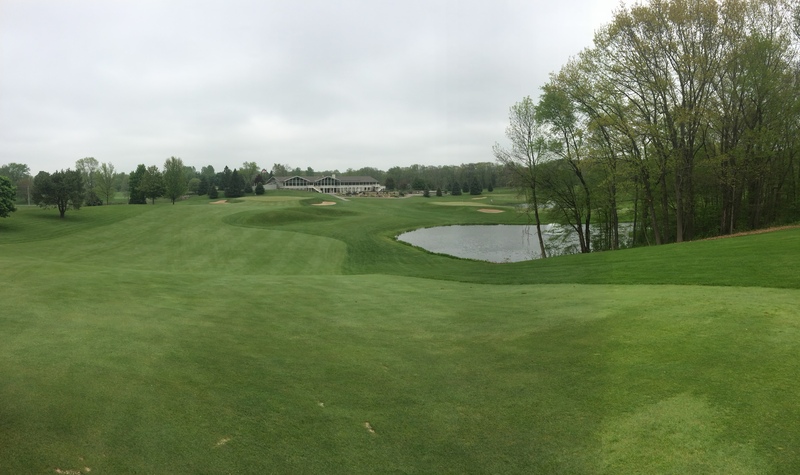 The elevation at West Bend Country Club is staggering. 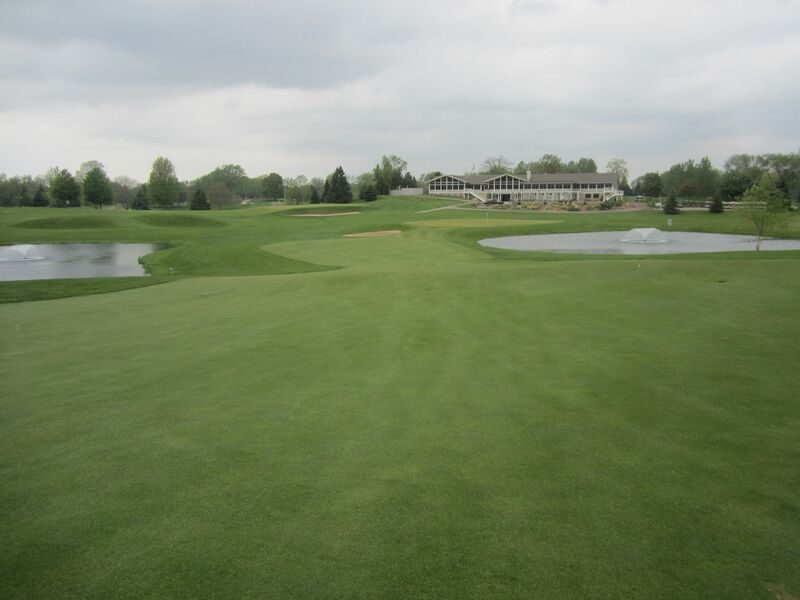 While the club’s website reads that the back nine was designed to allow for an easier walk for average golfers, neither nine looks to be a leisurely stroll. 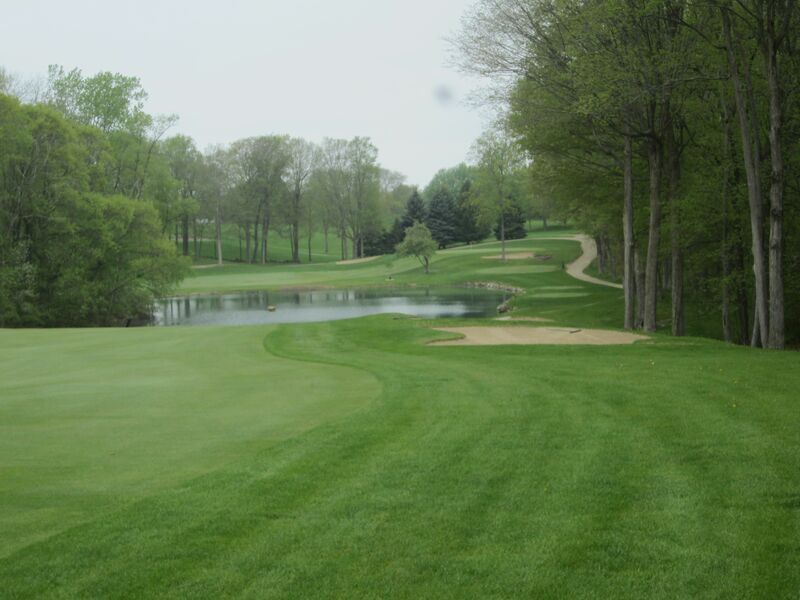 With beautiful rolling fairways and dramatically elevated greens, the course is photogenic to say the least. It is for this reason that I am including as many or more pictures of it on this post as I have for probably any course! 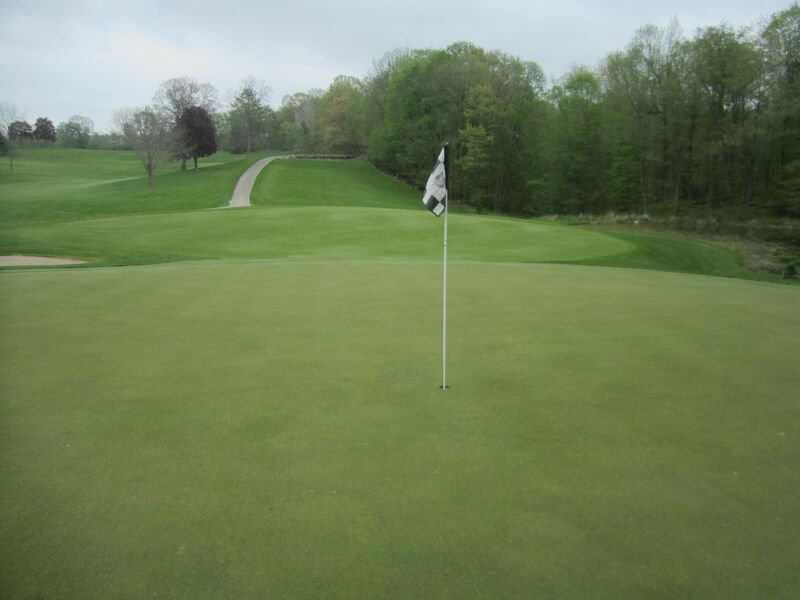 The practice putting green tells you as much as you’ll need to know about the greens at West Bend: They are really quick and have a ton of break in them. 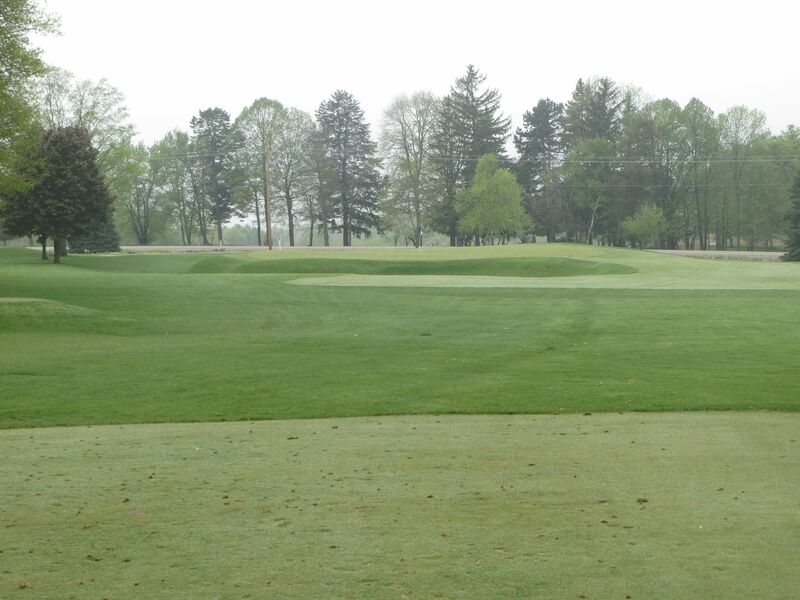 One of the most striking greens on the entire course comes really early on the first hole. 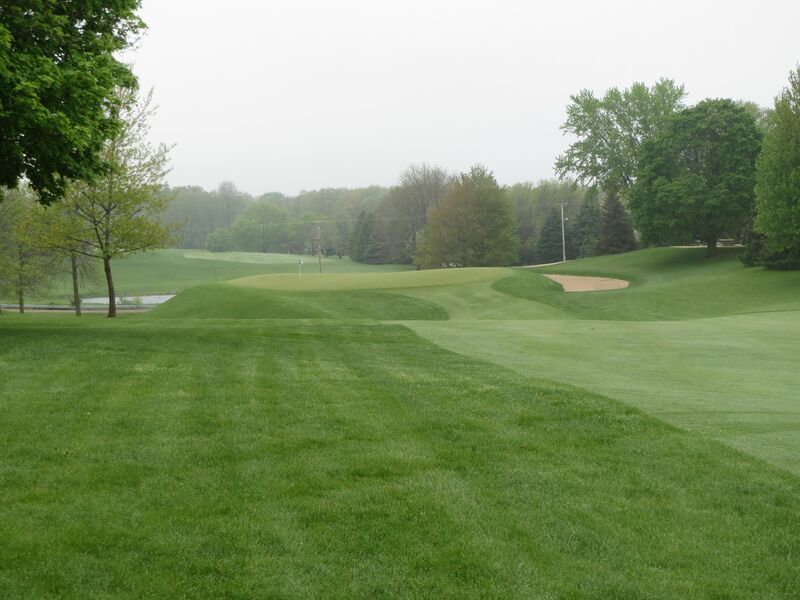 The fairway is wide and forgiving, with very little to worry about in the way of hazards other than the tree lines that border a whole lot of rough. The second shot is where this hole gets interesting, though, as the ascent up the fairway gives only a glimpse of this perched green. Be short and fall off the false front. 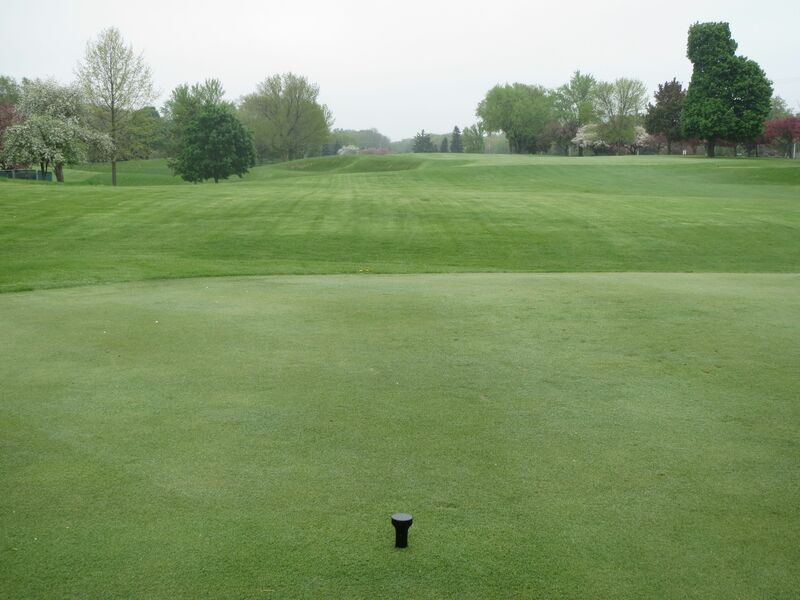 Go long and find yourself eight feet below the back of the green with the putting surface running hard toward the front. 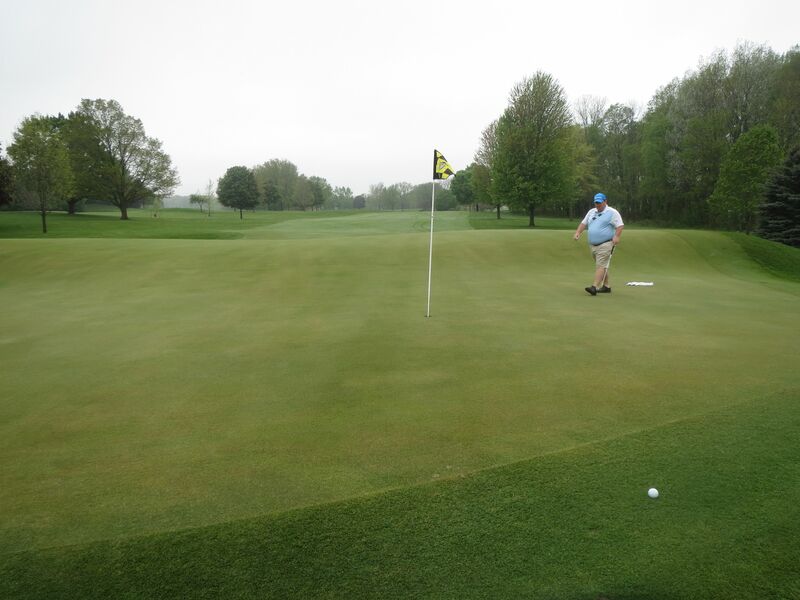 This was my first three-putt of the day (from 10 feet left of the pin! ), and would not be my last. 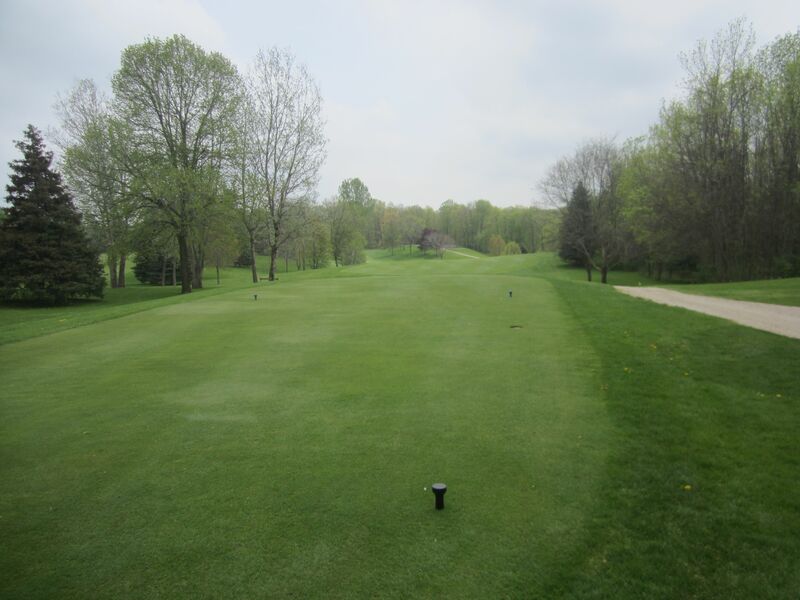 Target the left side of the fairway on two, as the treeline leans heavily toward the fairway. With an intense left-to-right crosswind on this hole (25+ mph for most of the day), my slice was exacerbated leaving me in the third fairway. 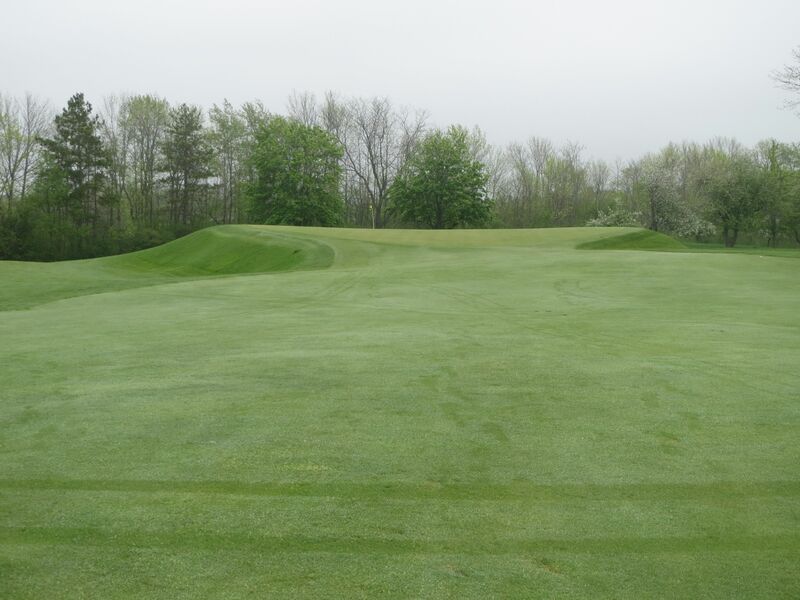 Following a recovery shot, I got my first look at this [yet another] beautiful Langford green complex, which rolls off the front left and is surrounded by deep traps below the putting surface. 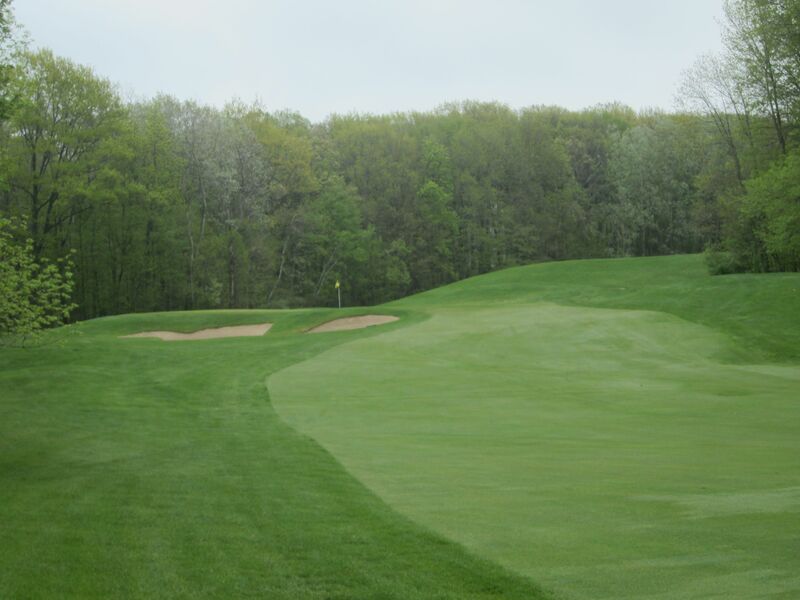 A mid-range par five, the third hole’s green takes the craziness of the first two greens and multiplies it exponentially. 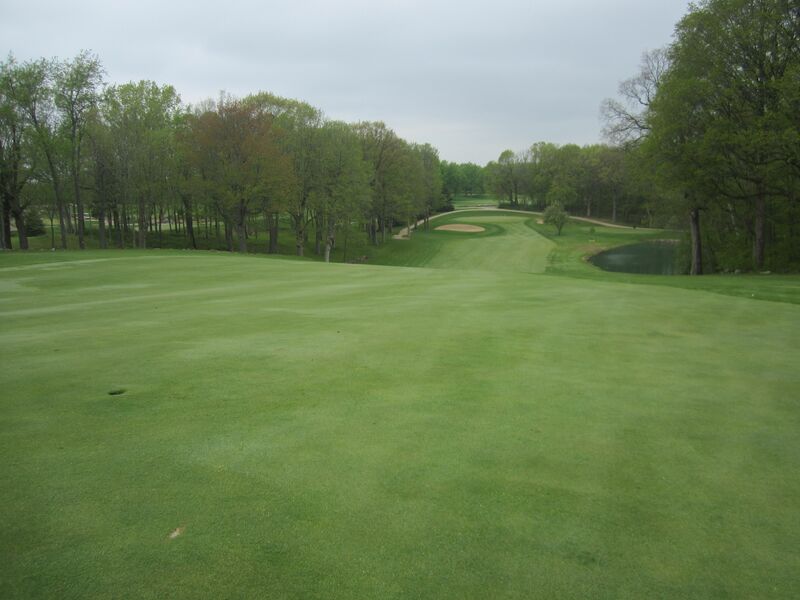 A 520-yard dogleg left from the tips (which we were playing), the back of the green falls off hard both deep, left and right. 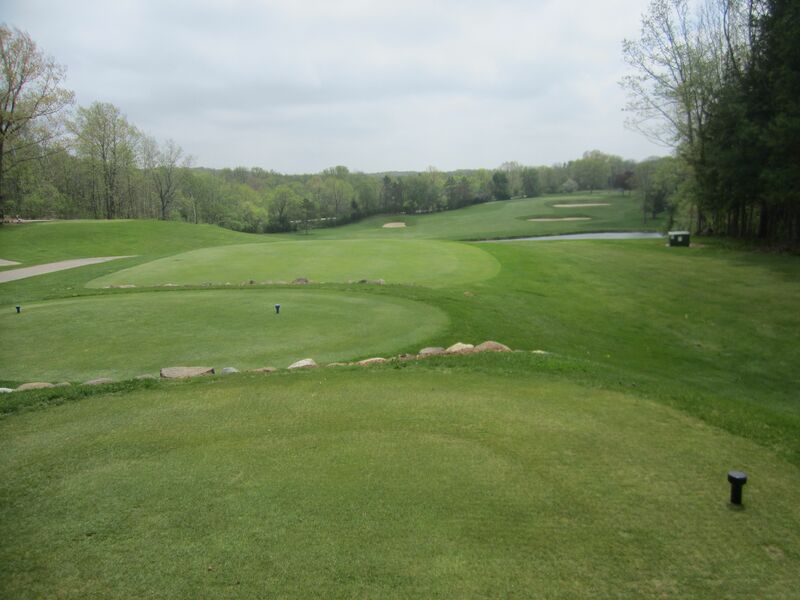 A long par three, the fourth hole plays from 217 yards from the tips, and angles downward from the back-left of the putting surface. 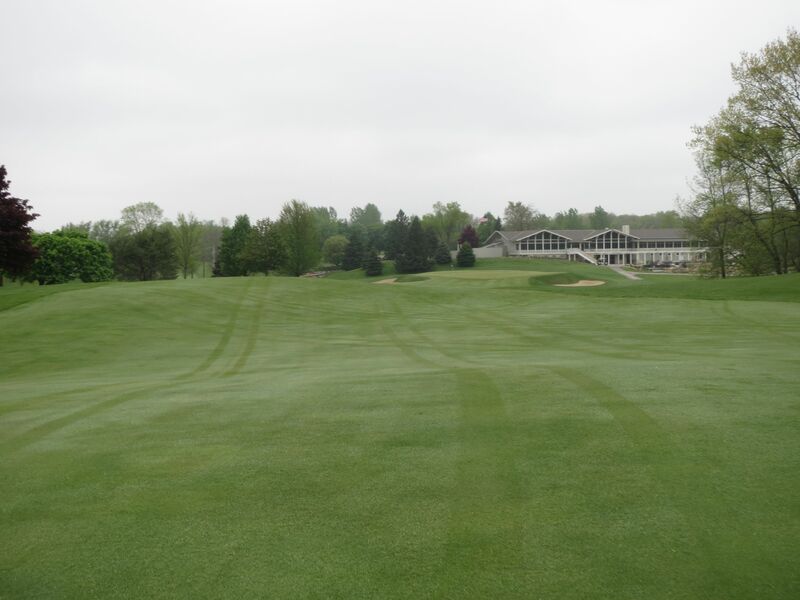 A wide sand trap fronts the green and needs to be avoided. 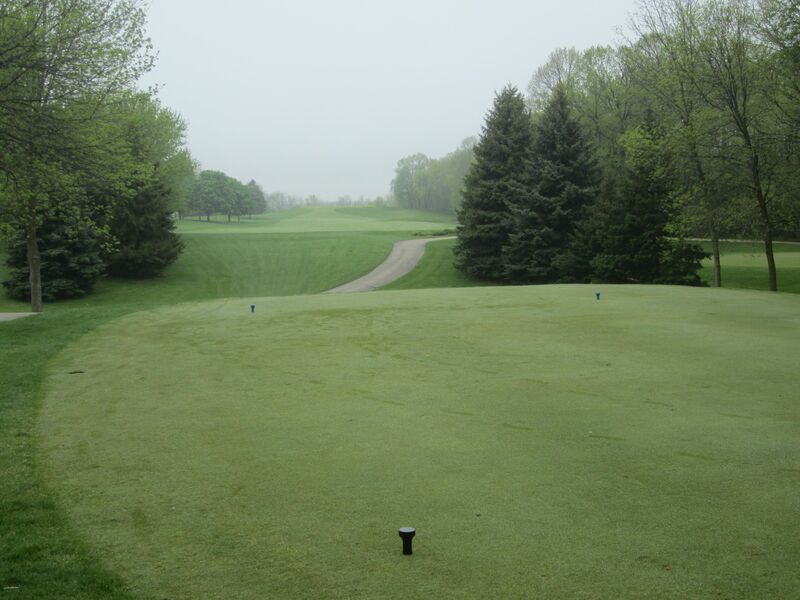 The fifth hole at West Bend Country Club is a mid-range par four from 392 yards from the black tees. This hole actually reminded me a bit of the fifth / “Road hole” at Lawsonia, with the road to the right and a blind shot off the tee. 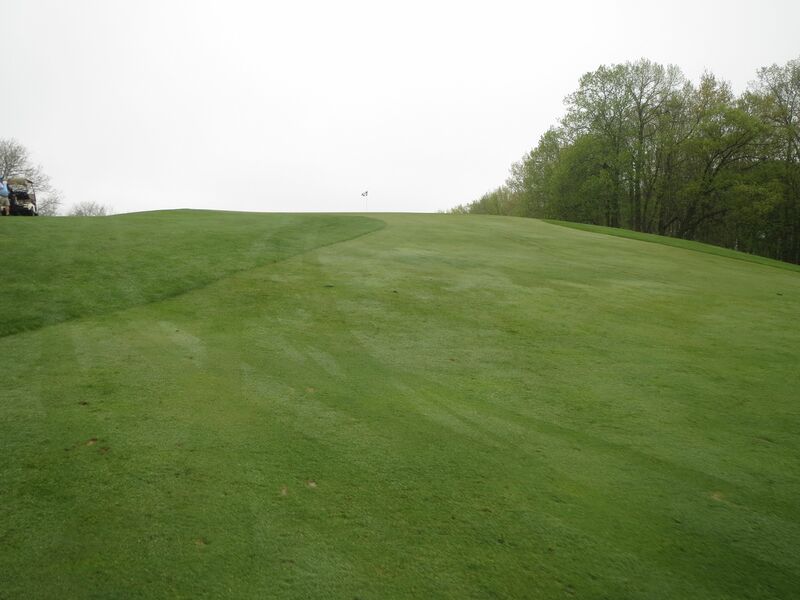 The left side of the fairway falls off hard, while the right side is tree-lined and leads downhill to a green that is very similarly constructed. 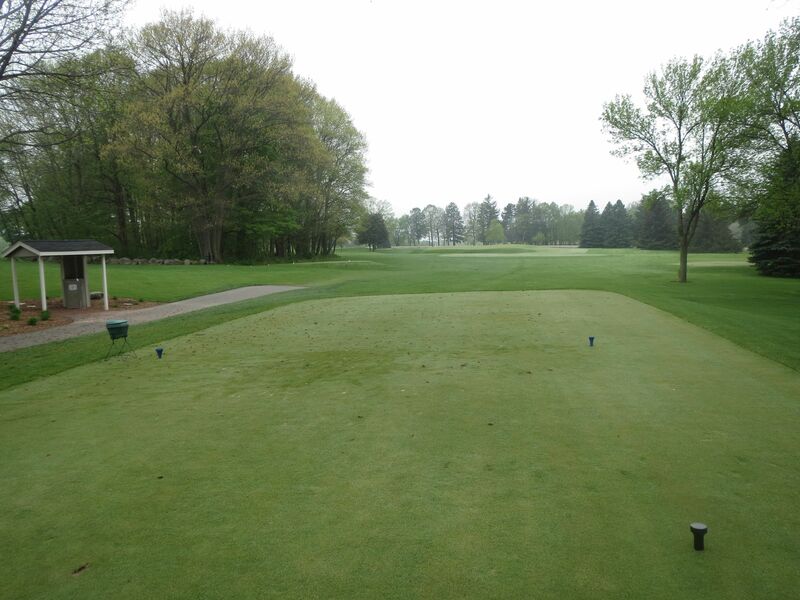 Crossing the driveway to the other side of the club’s property, the sixth hole is another blind tee shot that requires local knowledge for targeting drives. 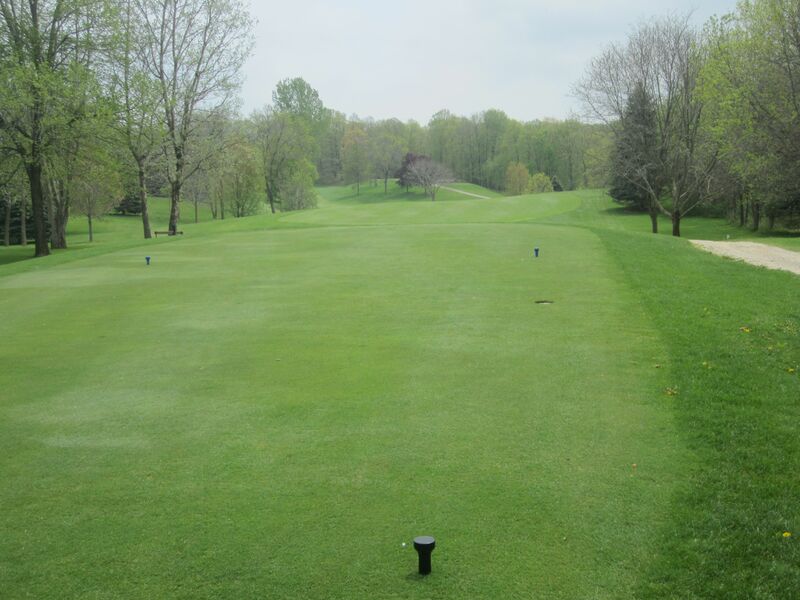 The left side is certainly preferred, as the right side leaves players in jail with the trees and a recovery shot that will have to fly way uphill. My recovery shot on six, which I actually got through the trees to the top of the hill! 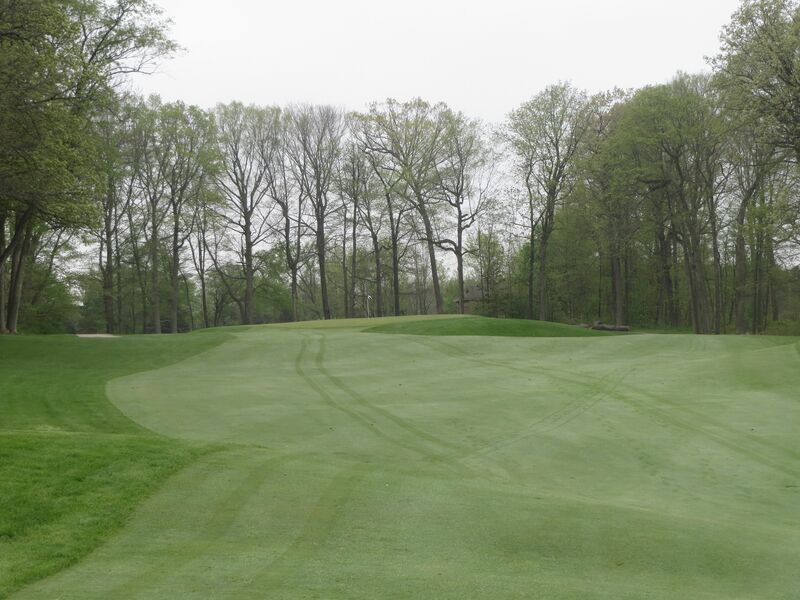 The uphill climb on this 557-yard par five results in an extremely elevated green with a fall-off area short-right. 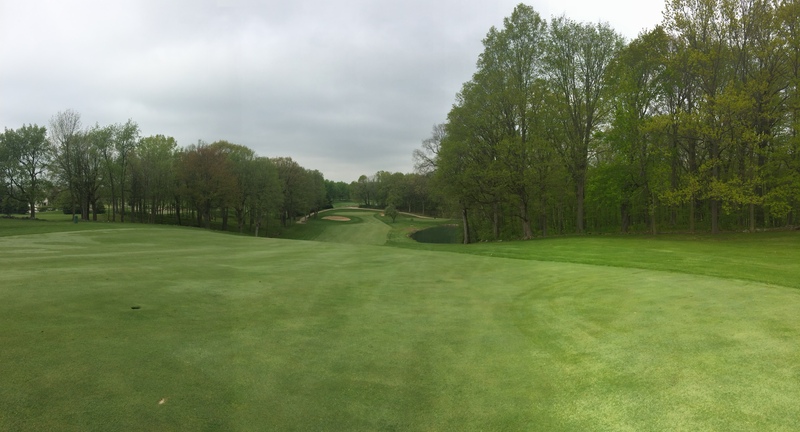 The seventh is not a long hole, but is an unbelievably challenging par four! 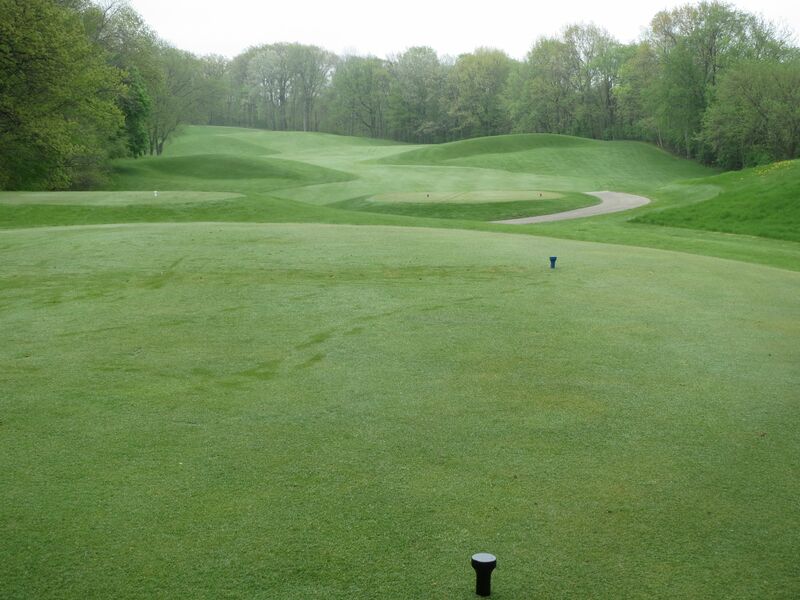 Find the right side of the fairway off the tee and have the best look in at what could be the most elevated green in the entire state of Wisconsin (it’s closest competition is probably the 8th Erin Hills, the 10th on the Irish course at Whistling Straits, and the 13th on the Meadow Valleys course at Blackwolf Run). This blows them away, though, with a green that rises four or five stories above the rough that fronts it. 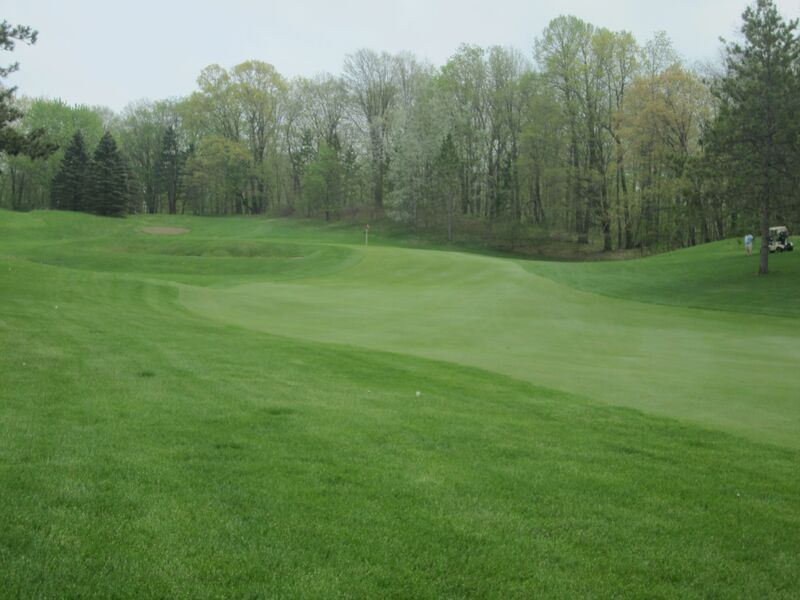 Another classic Langford par three, finding the right zone on the eighth’s putting surface means having a chance at birdie. Finding the wrong one means a likely three-putt bogey. 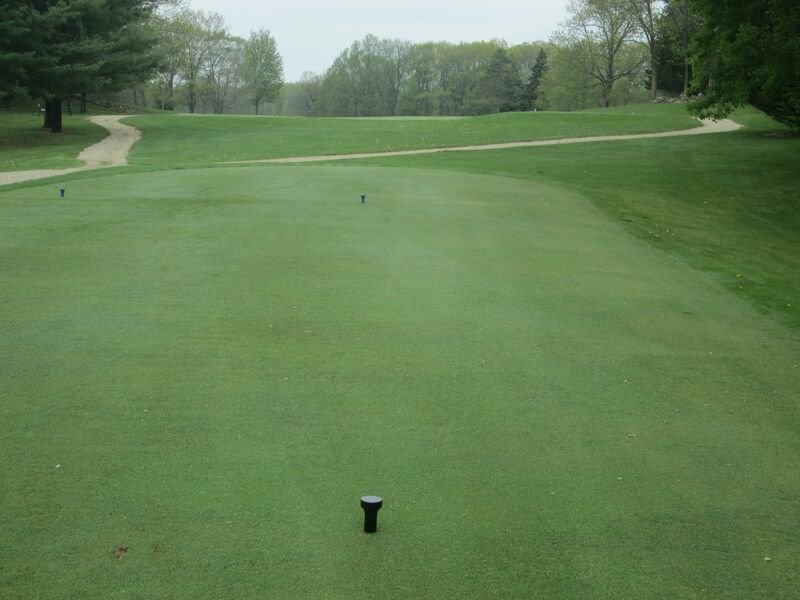 The trap on the left should be avoided my all means, as anything there has to come out and stop on a dime or else fall off the front-right of the putting complex. 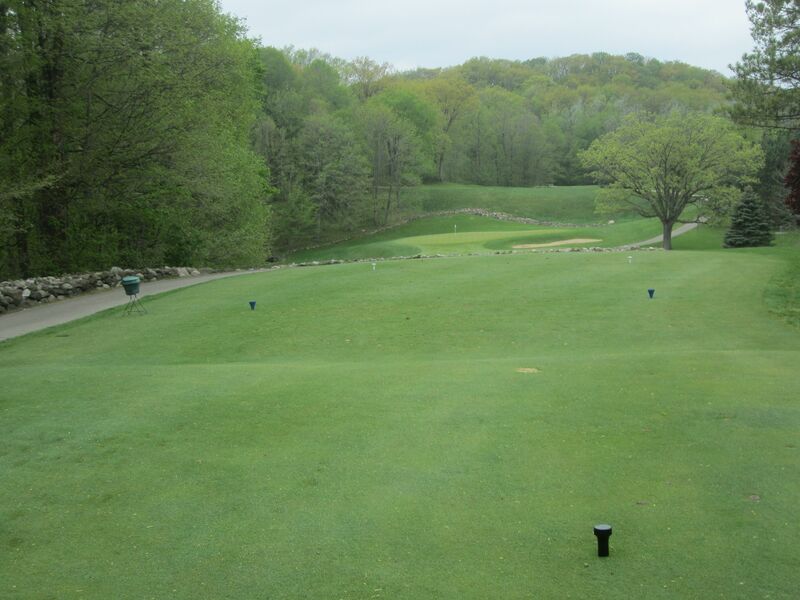 With a 20-plus mph wind at our backs, the ninth hole tee box was all systems go for long drives. 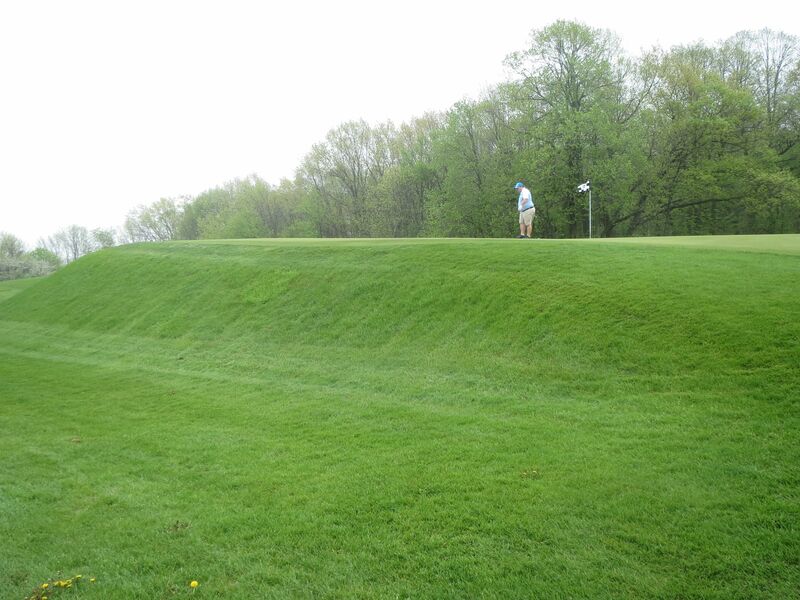 There is water on the right side of the hole down the hill, but even with the wind is not within reach. 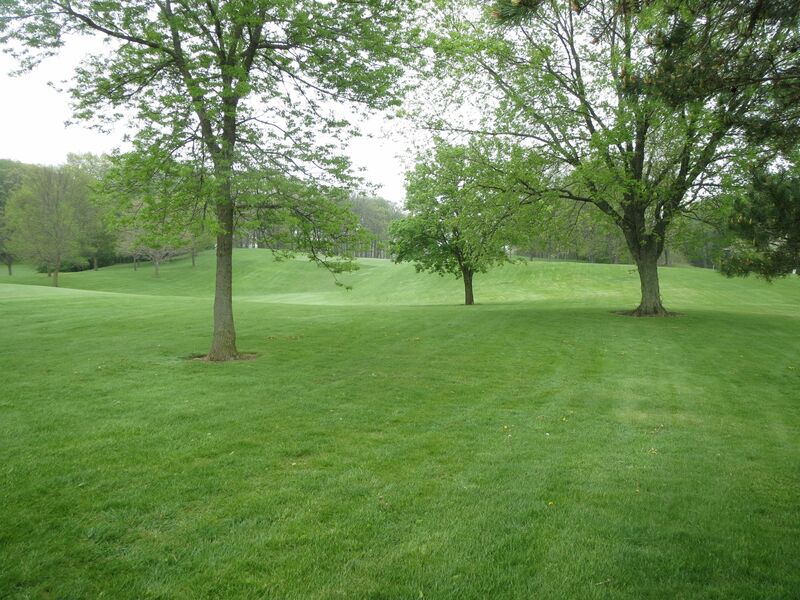 The ninth fairway is heavily mounded and runs toward the clubhouse. 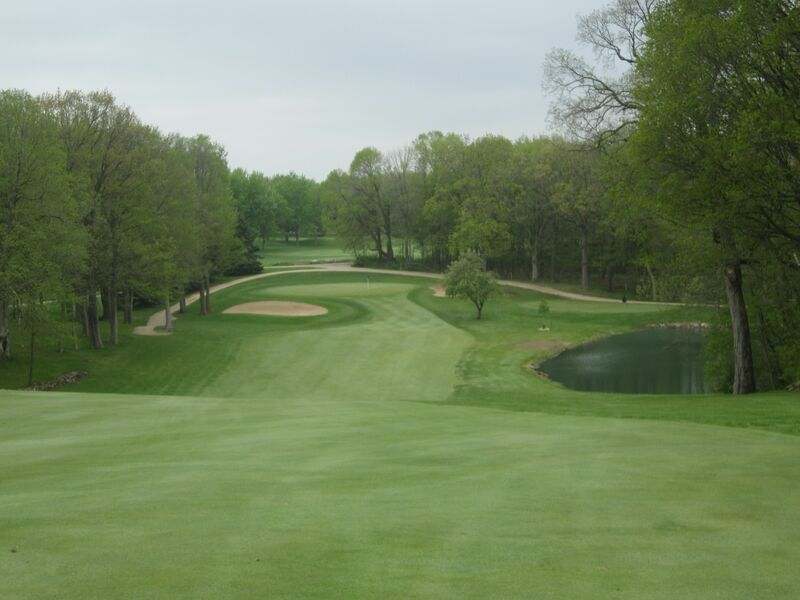 It is really a beautiful finishing hole for the front nine, and at 471 yards from the back tees I am sure makes for some very interesting finishes in nine-hole matches. 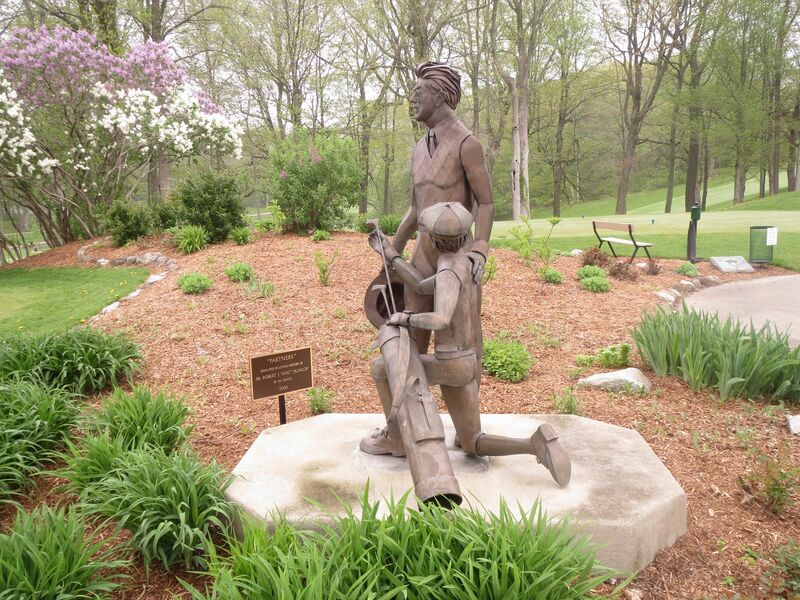 Langford submitted plans for an 18-hole course at West Bend Country Club back in 1928, but the decision was not made to expand to a full 18 holes until 1956. 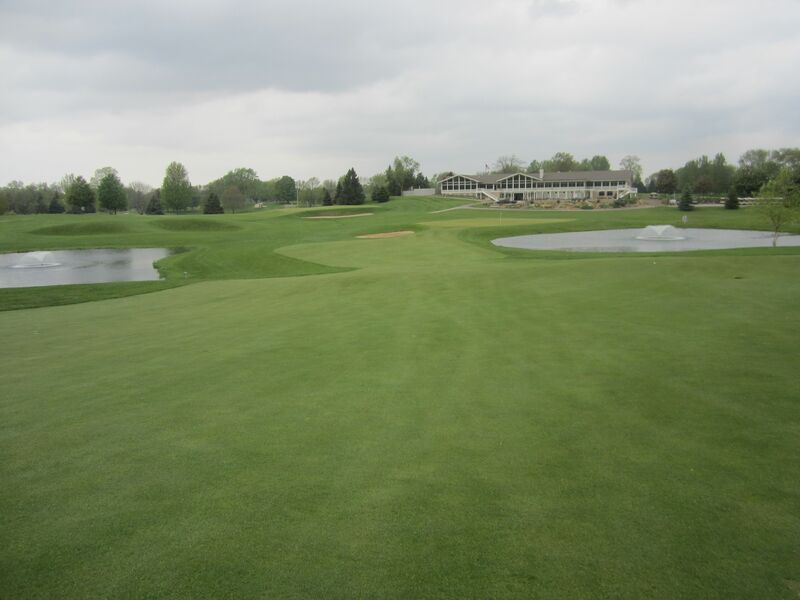 I half expected to not enjoy the back nine, as oftentimes when a course architect is brought in to “Make a course look like what Langford/Moreau would have done,” it turns out nice but certainly does not have the same look and feel. 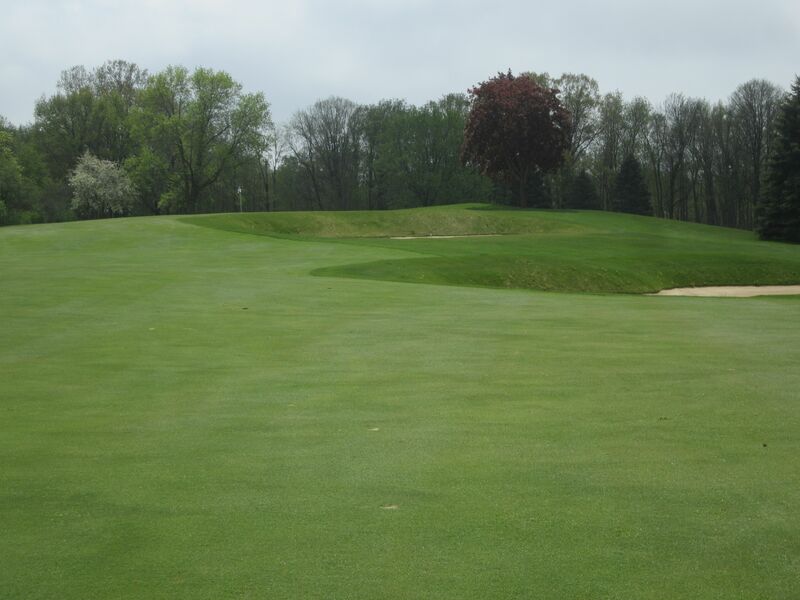 The angles are wrong, the bunkering is either too extreme or too subtle, and the greens tend to be too harsh and dramatic rather than Langford’s traditional “Let the soil settle where it falls” approach. 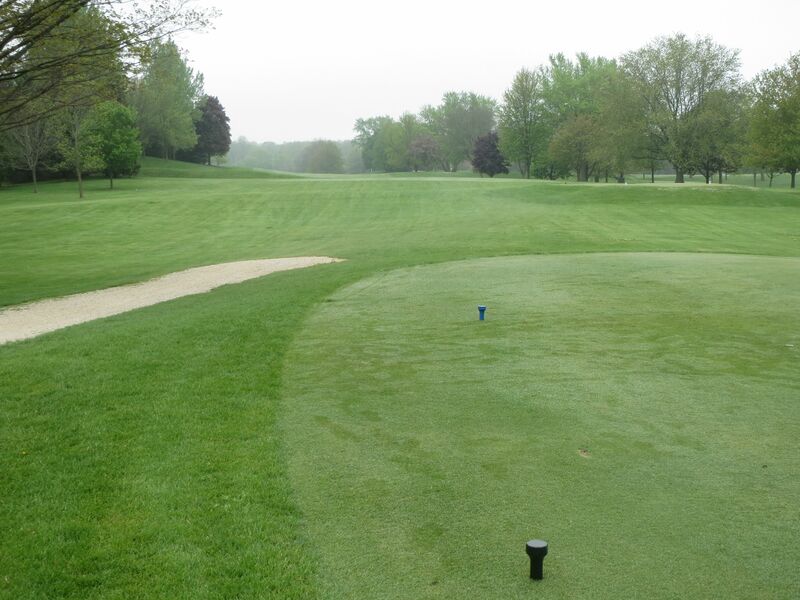 The back nine at West Bend Country Club is impressively different from the front nine. 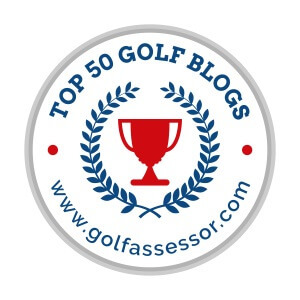 The bunkering is nicely done, and the greens are very nice – and challenging – without being overly ridiculous in an effort to copycat the legendary design team. West Bend’s front and back nines are different in feel, and this I am sure was intentional. 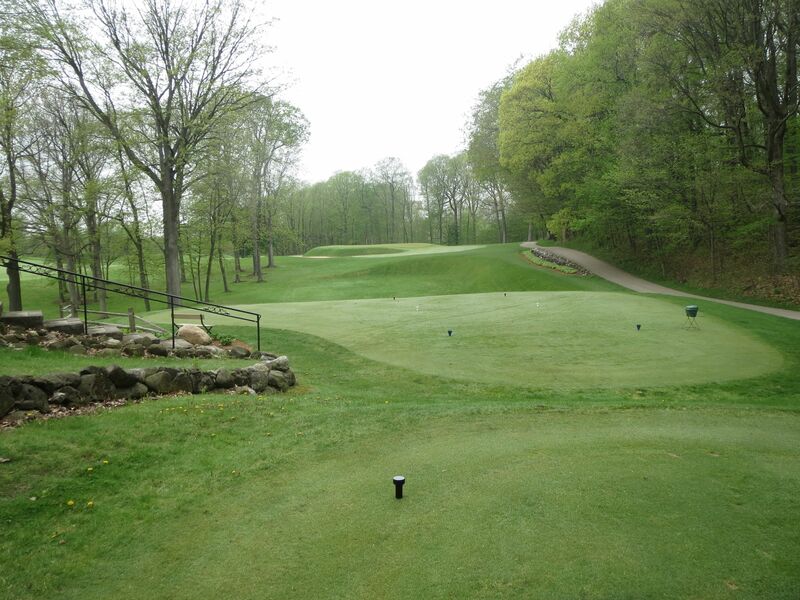 The eleventh is a phenomenal, short par five of 501 yards from the tips. Tee it high and let it fly off the tee – the second shot is the important one here as it doglegs left and way, way downhill to a small green through the chute created by the pond right and trees left. 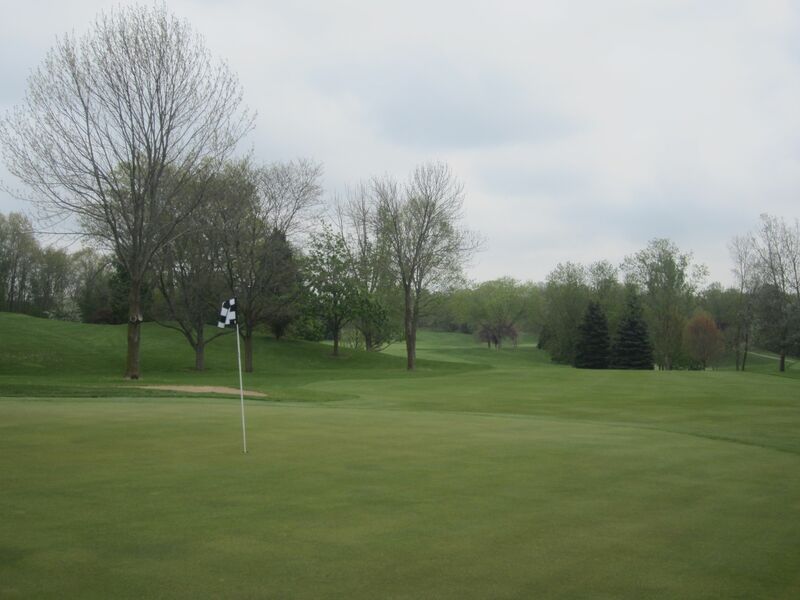 Uphill and to the right, the twelfth hole is fairly tight by West Bend Country Club standards, but not overly so, generally speaking. 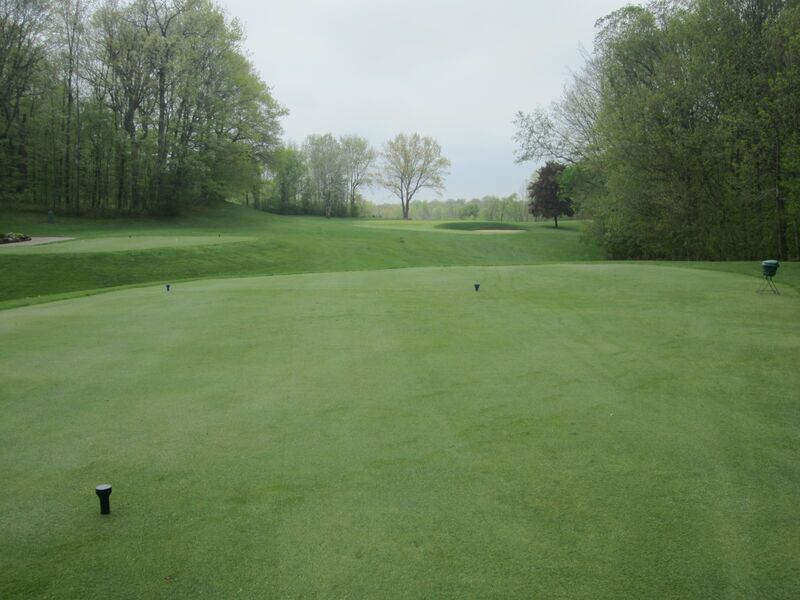 A tee shot to the left side of the fairway offers a perfect approach angle to this risen green. 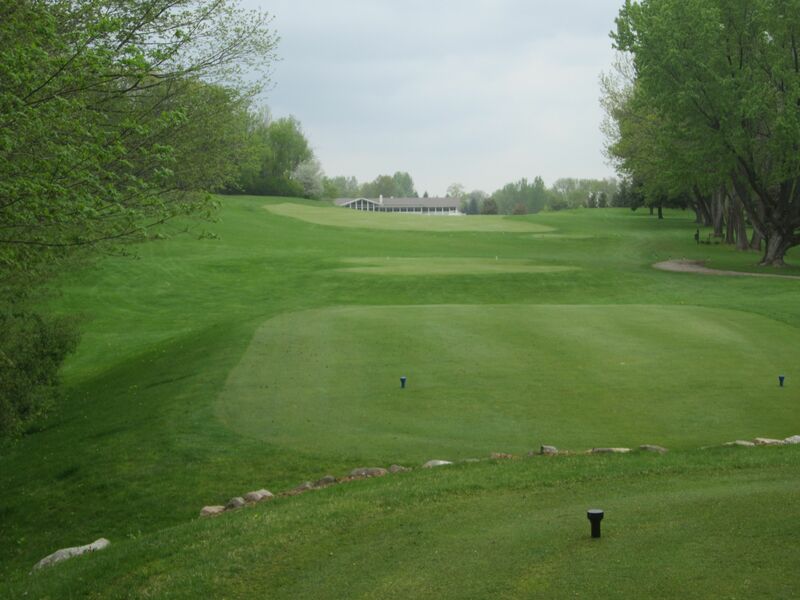 The thirteenth, while not the longest par three on the course, played as the second longest hole to par of the day. 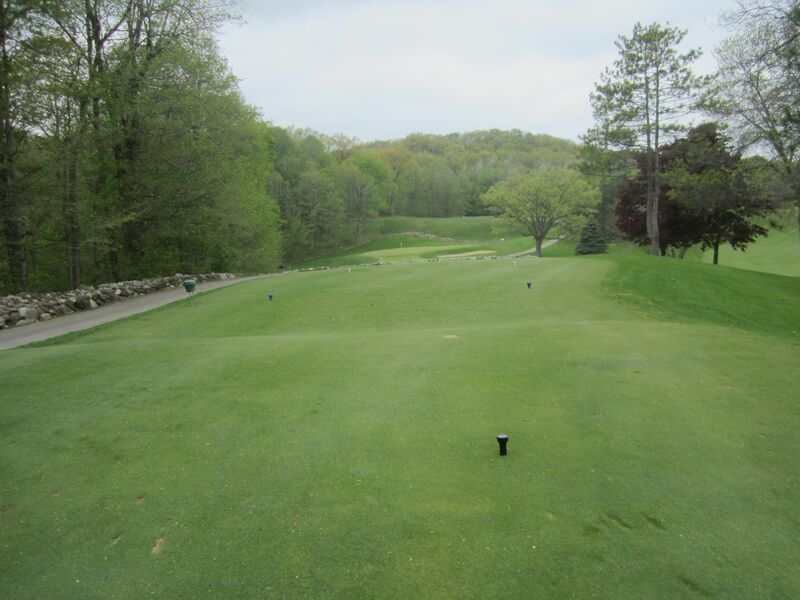 At 190 yards, none of us were able to hit the green with fairway woods. 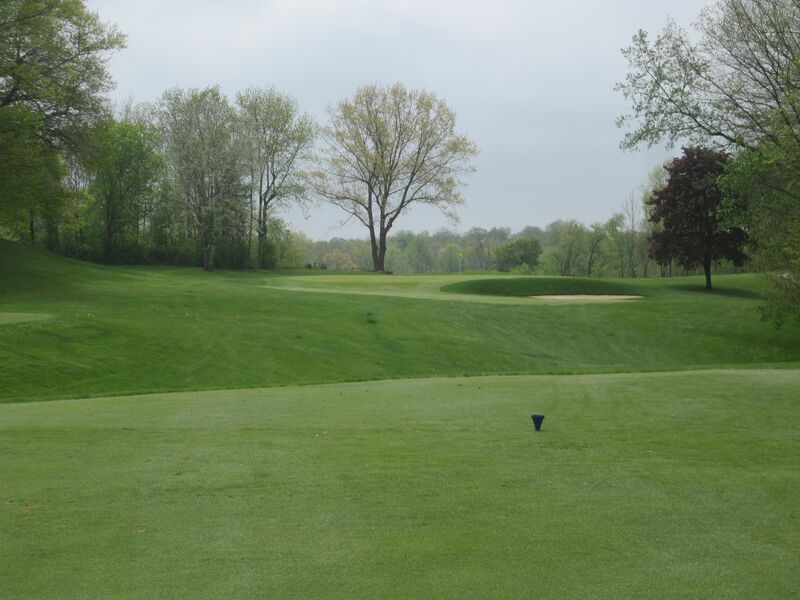 The 40-plus mph wind in our face here was extreme, but it is otherwise an excellent looking par three playing over a front-side trap with the front-left side of the green the best spot to miss at. If the wind was brutal on thirteen, it was even more so on fourteen. 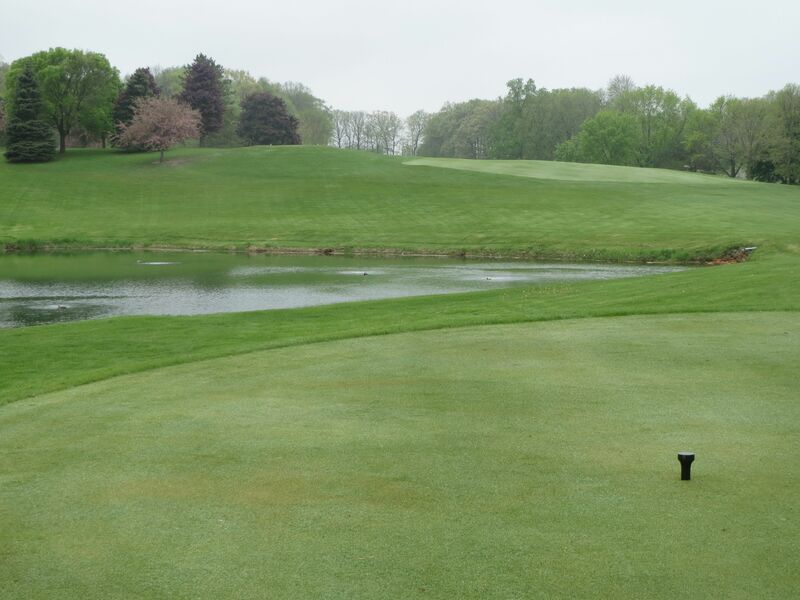 Normally an almost reachable par four from 340 yards and an extremely elevated tee shot, the wind was howling in our faces and slightly to the right, forcing everything closer to the pond that on probably any other day is just there for aesthetics. Kyle, a long hitter, really got in to a drive off this tee that we watched climb higher and higher in to the air, eventually reversing direction and dropping just past the pond. 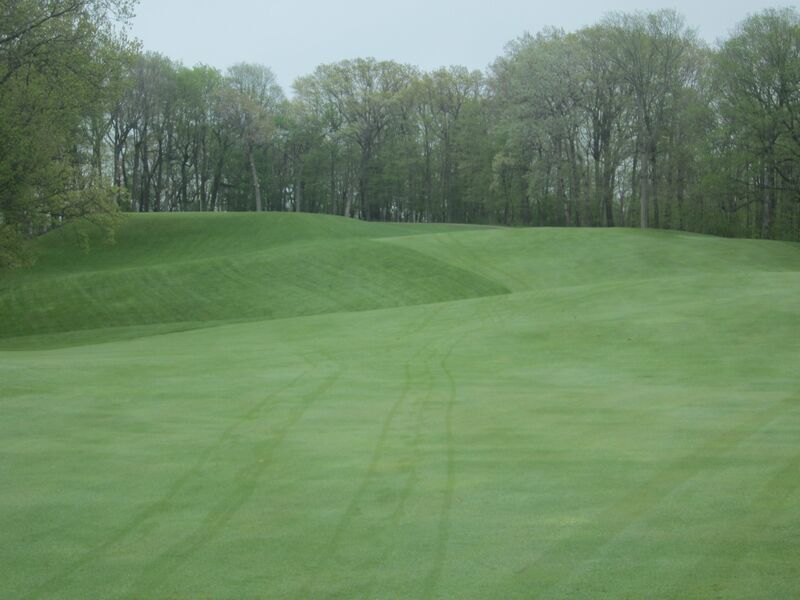 He still had 180 yards in to the elevated green complex on the other side of the two lateral fairway bunkers. 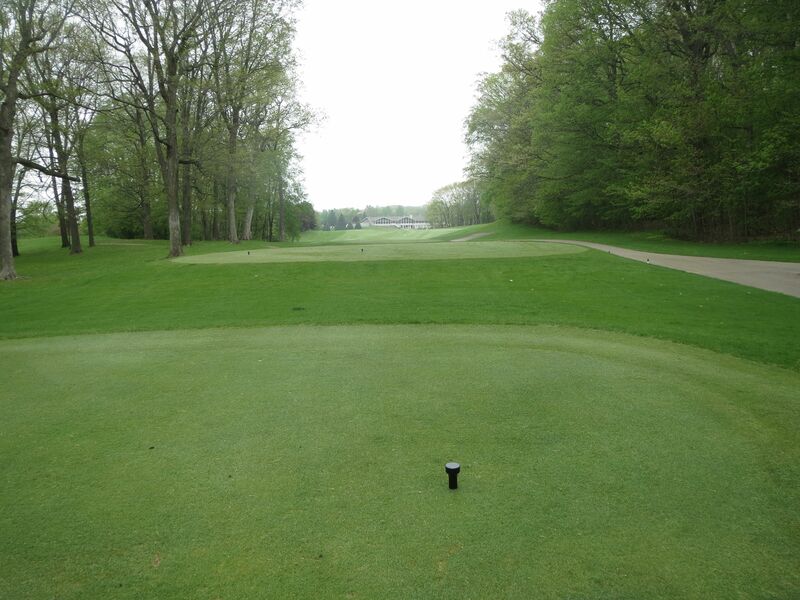 The 527-yard par five fifteenth is a great strategic hole. Long drives (with the wind, especially, like we had!) 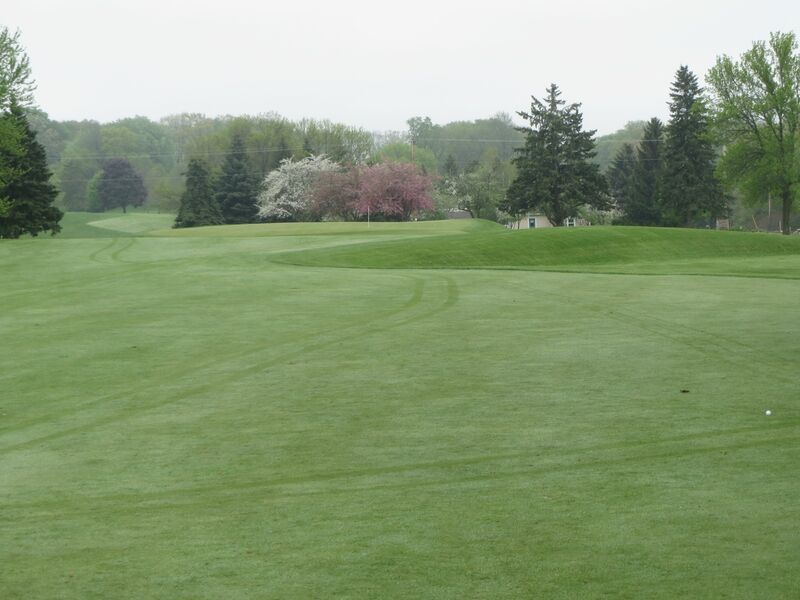 are rewarded with a chance to get home in two, while anything else will see players laying up to the left-side fairway shoulder for a short wedge in. 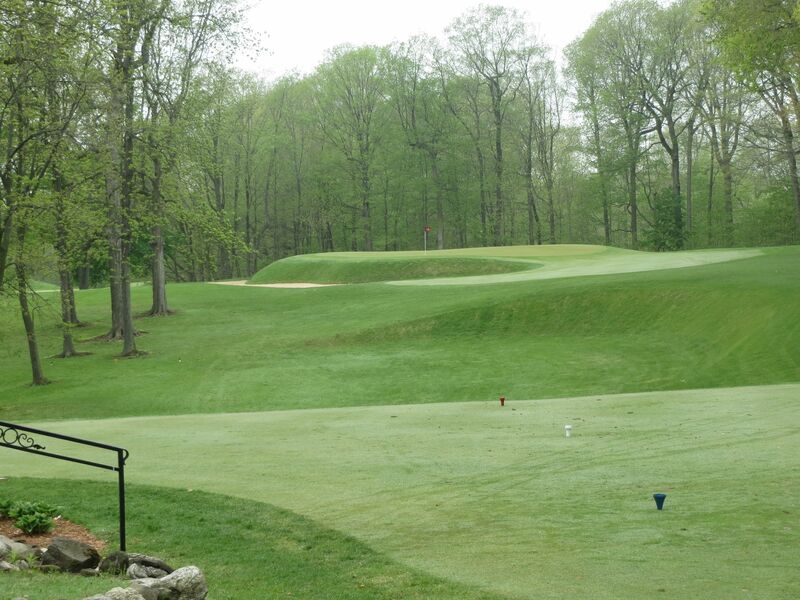 A mid-range par four of 386 yards, the sixteenth doglegs left and runs sharply uphill. 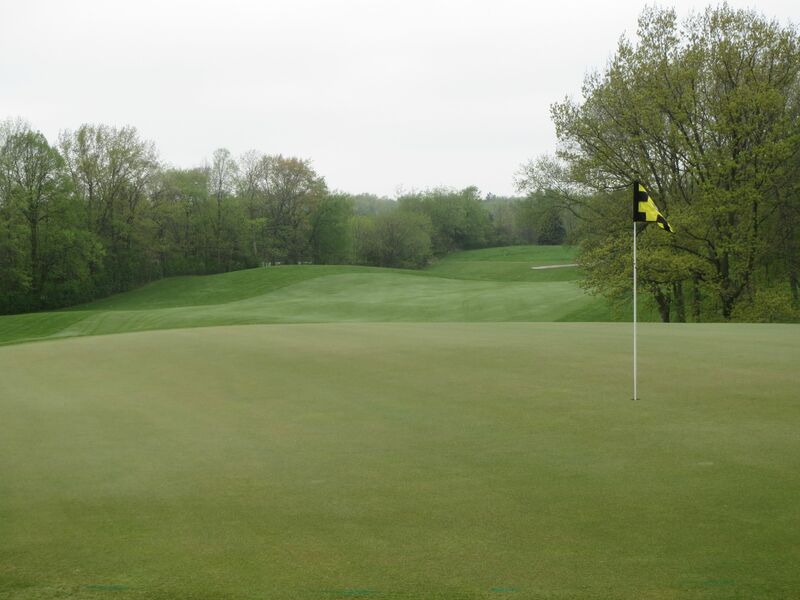 This is one of the most crowned greens on the entire course, making an approach to the middle of the green necessary for any chance at birdie. 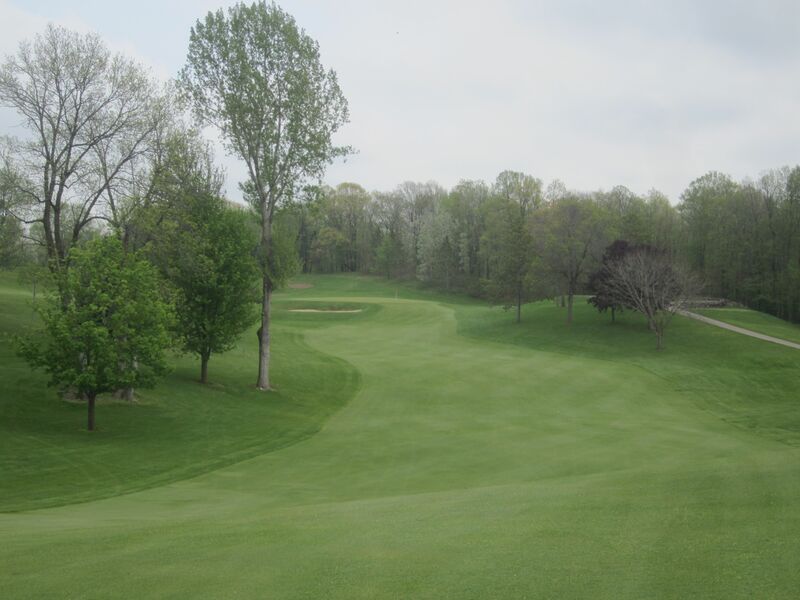 The beautiful par threes at West Bend Country Club continue on the downhill seventeenth. 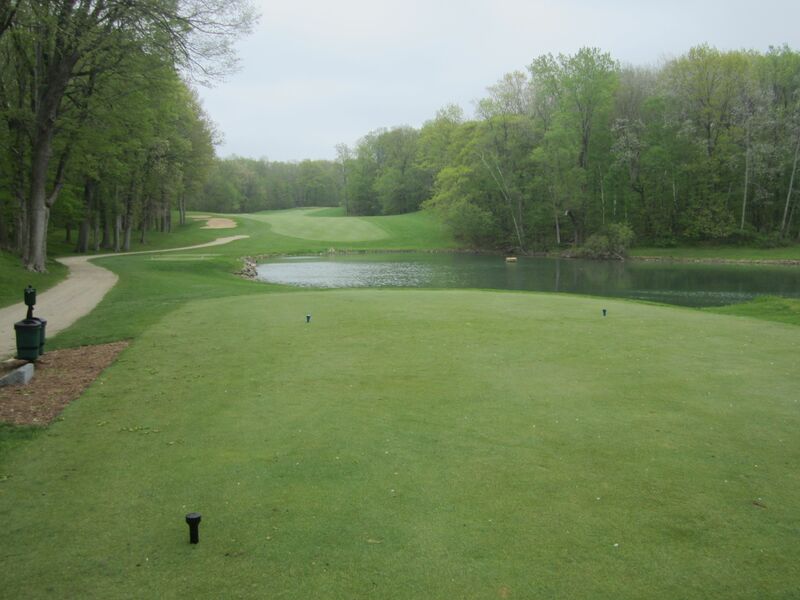 Teeing up from 183 yards from the tips, the pond short-left is not in view – probably a good thing. The bunker that fronts the right side of the green complex leaves a nasty shot out to a putting surface that slopes toward the water. A beast of a finishing hole, I had my best drive of the day on eighteen. The right side of the fairway rolls out left and downhill, like mine did, and can leave in a short approach over the pond. 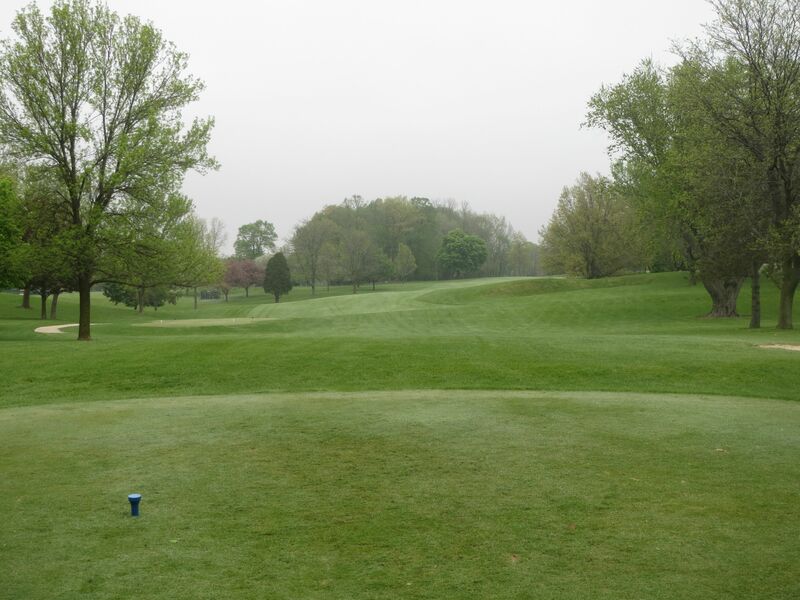 I had 120 yards in after the tee shot from 448, grabbed the wrong club (pitching wedge), and decided instead to “Take a little off of it” instead of hitting a full 52-degree wedge in. Watching the wedge shot balloon out to the right and the middle of the pond, Kyle asked me where I wanted to hit from. “Right here, with the right club,” I told him. I dropped the ball and hit my 52-degree to about 15 feet, dropped the putt for bogey and negated Jeff’s amazingly-scrambled par (I had a stroke on this hole). 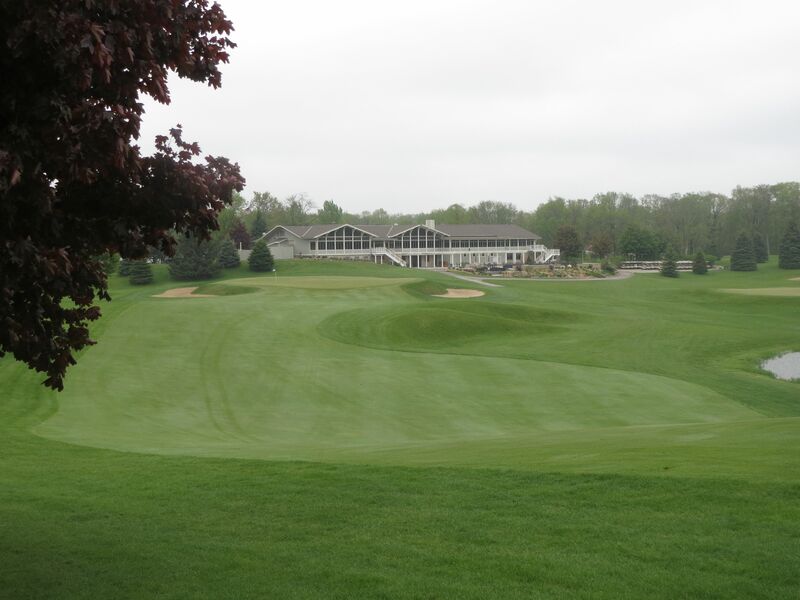 West Bend Country Club is the closest thing I have seen in the state of Wisconsin to Pine Hills Country Club in Sheboygan. 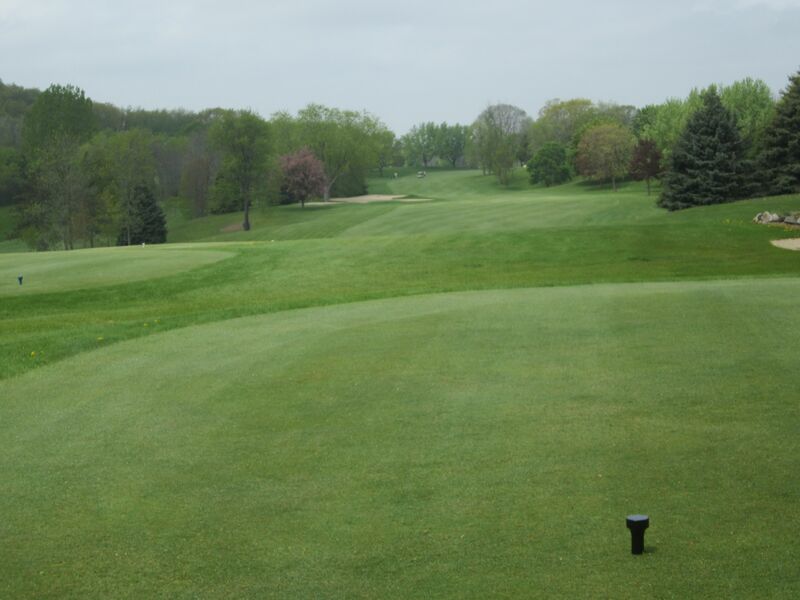 The outstanding use of elevation, fast, dramatically risen greens and gorgeous angles, beautiful course conditions and excellent food and beverage make West Bend a clear-cut top ten private golf club in Wisconsin. Will let you know in the first part of July, playing with my good friend Jerry Sullivan. Looking forward to it. Looks great but hard.